The only thing we can depend on is unpredictability. Our economic output is slowing down—and our standard of living isn't rising as fast as it used to. We'll have a high rate of chronic unemployment for some time to come. An outside-in strategy is the only sensible option. Raise productivity at least one and a half times higher than the real interest rate. Beat your competition by 10 percent. Make decisions three times faster, implement them faster and make sure they are economically reversible. Shoot for zero turnover of your real, genuine 24-carat talent. TRIGGER POINT ONE The only thing we can depend on is unpredictability. Why Bother Planning in an Unpredictable World? TRIGGER POINT TWO Our economic output is slowing down and our standard of living isn't rising as fast as it used to. TRIGGER POINT THREE We'll have a high rate of chronic unemployment for some time to come. TRIGGER POINT FOUR The mass market is splitting apart and, more than ever, the customer is the ultimate ruler. Don't Shoot for the Middle! TRIGGER POINT FIVE An outside-in strategy is the only sensible option. TRIGGER POINT SIX Raise productivity at least one and a half times higher than the real interest rate. Hands-on Management Is Essential—We have Too Many Layers! TRIGGER POINT SEVEN Beat your competition by 10 percent. Which Strategy to Beat the Competition—Commodity or Specialty? Can You Beat the Competition by Getting into the Merger Game? 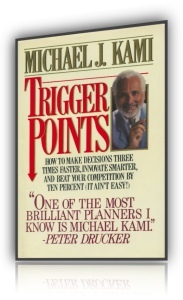 TRIGGER POINT EIGHT Make decisions three times faster, implement them faster—and make sure they are economically reversible. You Must Be Able to Say "Sorry … Never Mind"
TRIGGER POINT NINE Shoot for zero turnover of your real, genuine 24-carat talent. What Do We Mean by "Gap'? CASE STUDY ONE Eastman Kodak: A powerful giant pays the price for inflexibility. Kodak Tries a Turnaround—But Will It Work? CASE STUDY THREE Toys "R" Us: Implementing three simple principles pays off big. CASE STUDY NINE Sony: A premium-price innovator is plagued by low-price imitators. CASE STUDY TEN Procter & Gamble: A faltering giant changes its ways. Will Success Spoil Federal Express? PART SIX Conclusion: Let's have action. Ideas and concepts for innovation and uniqueness are usually inspired by external events and subtle changes in the external environment. The fact is that most major innovations in a particular industry originate outside that industry. The microwave oven developed from military contracts with Raytheon, not from the work of the home-appliance industry. Most IBM innovations did not come from IBM or even the computer industry; they came from the communications industry. Keep in mind that you can’t control your own future. Your destiny is not in your hands; it is in the hands of the irrational consumer and society. The changes in their needs, desires, and demands will tell you where you must go. All this means that managers must themselves feel the pulse of change on a daily, continuous basis. To rely on expert opinion and on consensus is to rely on conventional wisdom and the law of averages. This is not conducive to innovation because it is tied closely to the status quo. So managers should become socioeconomic crystal ball gazers themselves. They should have intense curiosity, observe events, analyze trends, seek the clues of change, and translate those clues into opportunities. One practical, tested method for doing this is razor blade reading. Don’t depend on print or audio clipping services—they do your thinking for you. Instead, subscribe to at least 30 magazines covering fields in which you are interested. Have them come to your home, because if you have a boss, it really doesn’t look too good when you’ve got 30 magazines on your desk and you’re reading them. Don’t read the magazines—scan them. Don’t delegate razor blade reading to your secretary, because after a year you will have a very knowledgeable secretary and you won’t know a damn thing. However, if you have a big company, you could get four or five people to take 10 different topics each and do their own razor blade reading. Once every 2 months, get together for dinner, have a little wine, and exchange views. When do you have time to read magazines? You’d be surprised at how many opportunities you have: early morning, at night before you go to sleep (I find that the Journal of Petroleum Statistics is better than a sleeping pill), in the bathroom; waiting in line, while you’re traveling. Can it affect my business? What problem may it create? What opportunity may it create? Whenever a piece of information triggers a potential connection with your business, cut out the item with a razor blade (or suitable substitute that you always carry with you). Don’t hesitate to mutilate your newspapers and periodicals—then throw them away. Clip immediately and date the clipping. Every day, file your clippings in the appropriate folders to create chronological series of data, information, and clues on the particular subjects. Review each file once a month. You’ll find that it can be a revelation. When new things begin to happen, you find references to them in many different sources. When you put all the bits and pieces together and review them, you can see a definite trend, whether opportunity or threat. You know something is happening, and that’s your trigger point for corporate action. Just 6 months ahead is all you need to beat the competition. Razor blade reading is useless unless it leads to a decision and action. This is the final test of the real value of the process. Will it generate better decisions and trigger earlier actions to exploit new opportunities or solve or prevent potential problems? Pick your own reading material according to your specific interests, but a good basis for getting started is the carefully selected list you’ll find at the end of the book. For daily coverage, The Wall Street Journal is essential. Another outstanding newspaper is The Financial Times of London, which has a high-technology communication system for early distribution in major U.S. cities. Business Week and U.S. News & World Report are excellent weeklies, and an informative biweekly is The Economist. Among monthlies, Fortune, Forbes, and INC stand out, and an indispensable quarterly is Quarterly Economic Outlook U.S. A., put out by the University of Michigan. For statistical reference material, the U.S. government is the most prolific source. Some useful monthly publications are Economic Indicators, Survey of Current Business, Business Conditions Digest, and Monthly Labor Review. For annual statistics, consult the U.S. Statistical Abstract (Commerce Department) and the Economic Report of the President, available from the Government Printing Office. I subscribe to 120 magazines—and scan them all. Since I also fly a lot, I combine the two activities to get much of my reading done in the air. Flight attendants see me stagger on board with about 30 pounds of magazines-and then walk off at the end of the flight without any. They’re neatly stacked up on my seat—all I’m carrying is a small bundle of clippings. One thing I’ve learned, though, is to cut my address label out of each magazine. I’ve done that ever since a friend called me and said he’d found a stack of magazines I’d accidentally left behind on an airplane seat—and he was sending them all back to me.